To begin, I am setting up a Site-to-Site VPN (Virtual Private Network) between my home-lab and Azure. The same concept(s) can be applied to an On-Premises/Data-Center environment and enterprise grade firewalls/routers. For starters you will need to know the IP of your home network, my IP is dynamic, so it is continuously changing. If you don’t know your public IP, go HERE to get that now. Also, I will be using the Azure Resource Manager portal, and not the classic portal, and lastly working with IPv4, not IPv6. Lastly, I am going to assume you already know a few things about Azure, Windows Server 2012R2 RRAS (Routing and Remote Access Service) and the basics of Networking. Now we need to create a Virtual Network. This virtual network will provide IPs to machines assigned within this resource group. The IP spacing can be whatever you choose, however it is best to choose an address space different from your home-network. I have chosen a 172.10.0.0/24; my home network is a 10.10.10.0/24.The resource group will always the one you created back in Step 1. Next I will add two subnets, one for the back-end and one for the gateway of my servers. Within your Virtual Network, select Subnets, and add as many subnets as needed. Next we will create the Virtual Network Gateway. The virtual network gateway will be responsible for sending and receiving data. Essentially the bridge between (gateway) Azure and your RRAS server/home-network. I have kept the defaults, VPN as the Gateway type, and Route based for the VPN type. The resource group will always the one you created back in Step 1. Depending on your environment and requirements, you will need to decide which VPN type is best for you. Route based, will support dynamic routing and support multiple VPN connections, using IKEv2. Policy based, will support static routing, supporting a single VPN connection, and will use IKEv1. VPN type will be Route based. Now we need to create the local network gateway, this gateway will be configured with all of your on-premises network. The resource group will always the one you created back in Step 1. Now that all the fun stuff is done, now we need to create the VPN connection. Within the Local Network Gateway we just created (Step 4) go within the Connections, and configure a VPN connection. You will need to specify the Virtual and Local LAN gateways we created in Step 3 and Step 4, for the Virtual Network Gateway and Local Network Gateway, respectively. The Shared key (PSK) will need to be a string that will be used between the VPN connection and your RRAS server to encrypt and authenticate. I used a password generator with 32 characters, and only used letters and numbers (no special characters). Make sure to save this key, because you will need it in the Windows RRAS setup to complete the Site-to-Site connection! Great Step 1 – Azure done! After configuring the RRAS server, we will need to come back to Azure, and connect/confirm the VPN traffic is flowing. Microsoft explains this pretty well and it is pretty straight-forward, so I won’t bother, see HERE. Continue through the wizard, choose VPN. Leave Route IP packets on this interface enabled…. Now add the Static Route for your local network, as mentioned, my network is a 10.10.10.0/24; 255.255.255.0. Once complete, right-click on the interface we just created, and go to the Security settings. 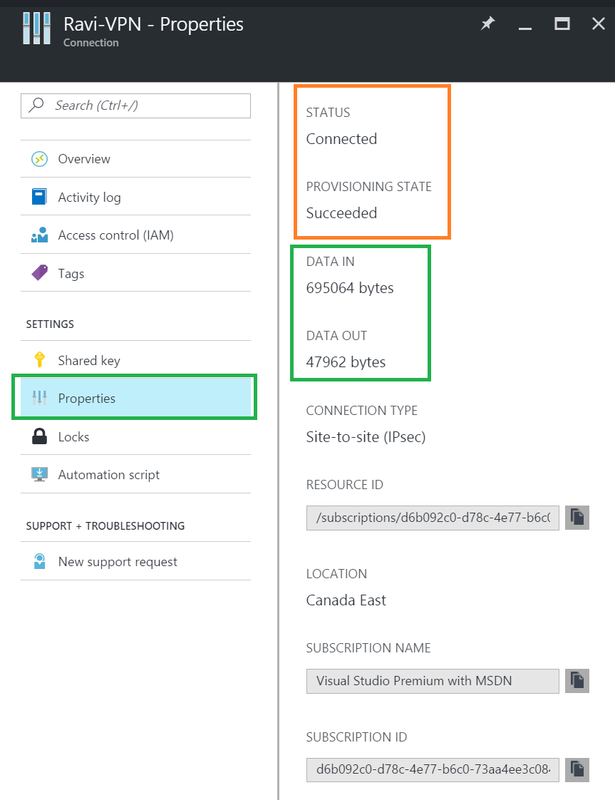 By default “Use machine certificates” will be enabled, select the preshared key for authentication option, and now enter that PSK we used in Step 5 of Azure…. Hit OK, and now let’s try to connect…..
Give this a few minutes, I gave it about 5 minutes, and it finally connected to Azure. Go back to Azure, and within your VPN connection, hit Connect. For me, this took some time. Initially it connects, then fails, and repeats for a few minutes. I’d say after 5 minutes or so, it finally connected and stayed connected! YAY! After all that, we now have a VPN connection established between Azure and my home network. This is evident as we can see traffic going in and out via Azure’s Gateway! Sweet!!! If you have an ASUS Router, here is what you will need to do to configure the Static Routing. I am using a ASUS RT-AC68U with OEM firmware. You will want to add the local IP of your Windows RRAS server we configured earlier, and add the entry here. Navigate to the LAN Advanced settings, then within the LAN settings, choose the Route tab. Metric, since we chose 1 when we configured the Static Routing within the RRAS server, will apply the same value here, for me, I choose 1. If you want to confirm you Azure VM/Resources can see your On-Premises machines…. After all that, I created a Virtual Machine within Azure. Once the machine was online, it took an IP address from the Local Network and gave itself 172.10.1.4. I disabled the Windows Firewall, and tried to ping my on-premises RRAS server, and I go a ping response! You might be right here. I will test this again.